Enough time has passed by now for all of us to get used to the fact that George Clooney is getting married. Sure, it's something that none of us thought we would see during our lifetime considering all the times George Clooney said he'd never get married, but Amal Alamuddin seems pretty sweet for the luckiest woman in the world and their Italian wedding is sure to be ten times more beautiful than the Kimye wedding. With all of that settled, we're getting more and more curious about the wedding itself. Aside from the location, it appears one more thing might be checked off the to-do list. According to his aunt, George Clooney will ask Brad Pitt to be his Best Man and we're not sure how she came to that conclusion. Clooney may not have confirmed it himself yet, but it definitely makes sense. If there's one thing that George Clooney was known for, aside from being a bachelor and the most handsome man over 50, it's the sheer number of celebrity best friends he has under his belt. He probably has enough to fill out an entire line of groomsmen at this point, so narrowing it down to one to be his Best Man could be the hardest part of planning this wedding. 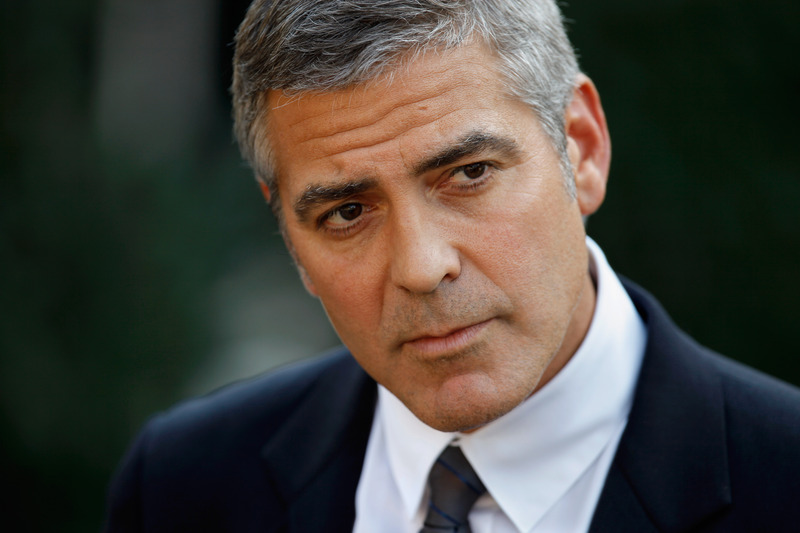 Whether he does decide to go with Brad Pitt or not, Clooney should make sure to explore all of the options thoroughly. In fact, we'll help him out. History: George Clooney and Brad Pitt starred together in Ocean's Eleven back in 2001 and 10 years later it looks like Clooney will be getting married before Pitt, despite Pitt having been with Angelina Jolie since 2005. Irony aside, the two actors have always supported one another. Pros: Clooney is close with both Jolie and Pitt and their family alone could fill his entire side of the wedding hall. Cons: Red carpet prankster and Brad Pitt fan Vitalii Sediuk might crash the wedding and no one wants that. History: George Clooney and Rande Gerber have been besties for a long time and they even have vacation homes next door to each other in Los Cabos, Mexico. In fact, they're so close they nearly just got one big vacation house before Gerber's wife, Cindy Crawford, reminded Gerber they had kids to consider. Pros: Gerber probably knows Clooney the best of all of his celebrity friends and could throw him an amazing bachelor party in Vegas. Cons: What happened in Vegas probably wouldn't stay in Vegas because Gerber might tell Crawford all about it. History: Steven Spielberg couldn't help singing George Clooney's praises when Clooney received an Ambassador for Humanity Award from Spielberg's foundation. Clooney thanked him with the world's most epic photo bomb (aside from anything Jennifer Lawrence ever does ever). Pros: Spielberg is regarded as one of the finest directors in motion picture history, so if anyone can make sure Clooney's wedding is beautifully shot it's him. Cons: As much as we might be clamoring for it, Clooney might not actually want his wedding to be a feature film. He's not a Kardashian. History: Ben Affleck and George Clooney have been close friends for years and it's hard to get either of them to say a single negative word about one another. Plus, now they're both able to brag that they played Batman. Nothing unites friends like the Dark Knight. Pros: Ben Affleck is a screenwriter, so that Best Man speech is going to be nothing if not poignant and beautiful. Cons: Clooney might have to comment on Batfleck to get Affleck to agree to be his Best Man. History: George Clooney and Matt Damon are frequent co-stars and even more frequent partiers. Prior to this, Damon was rumored to be Clooney's pick for Best Man and Clooney has even pulled pranks on him in the past because they're giant children. What more could you want in a Best Man? Pros: If anyone were going to act out a real life version of The Hangover, it would probably be these two. Cons: Ben Affleck might get really jealous if Clooney keeps stealing his best friend like this. History: Julia Roberts and George Clooney are so close that everyone constantly thought they were dating. They're so close that Shailene Woodley models her friendships off Roberts and Clooney. They're so close that Roberts practically helped Clooney propose. Who says your Best Man can't be your Best Woman? Pros: Gender norms are so 1999. Julia Roberts starred in Pretty Woman and planning a bachelor party is just a few steps up from that, right? Cons: If The Hangover was any indication, it would probably be best for Clooney not to invite any women to his bachelor party.